Harbourside Engineering Consultants (HEC) was contracted by Dexter Construction to provide specialist structural construction engineering services for the replacement of the existing St Peter’s Swing Bridge in Cape Breton, NS. The new structure consists of a two lane two span (27.1 m – 16.4 m) bobtail swing bridge over the historic St. Peter’s Canal. 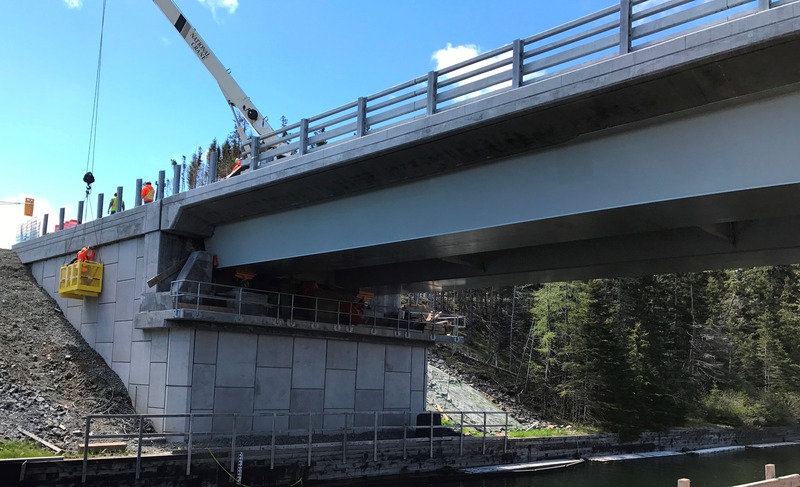 The structure consists of cast-in-place reinforced concrete deck supported by twin trapezoidal steel box girders founded on cast-in-place concrete piers and abutments complete with socketed piles. Swing bridge balancing design including detailed weight takeoffs, development of staged construction sequence, development of sequential balancing procedures (sequential concrete counterweight pours throughout construction to maintain stability during all stages of construction), development of refined balance procedures, development of fine balance procedures, on-site supervision of balancing and all required balance reporting. Design of detailed bridge jacking procedures both for balancing as well as for synchronized vertical lift and vertical rotation of the entire bridge structure. Assistance in development of temporary closing procedures (without use of the hydraulic system). Assistance in development of center bearing setting procedures. Design of temporary steel bents to facilitate construction in the open position. Demolition design of the existing single lane truss swing bridge. Slope stability analysis under crane lifting loads for steel erection.